It's easy for a day hiker in the eastern Dolomites to get in the thick of them, day after day. "The Dolomites" doesn't clearly define a region and then there are the Brenta Dolomites to add to the nomenclature confusion. When we speak of "The Dolomites" we mean the area that pleases us the most. Our favorite tromping ground is a rough rectangle formed by Bolzano (Bozen) at the far west end, Auronzo at the eastern end, Dobbiaco to the north, and Cavalese and San Martino di Castrozza to the south. Unfortunately, the 'good stuff' is scattered here and there within that rough rectangle and does not necessarily extend to all of the edges. For a quick trip into the Dolomites or a longer stay without covering a lot of miles, our top pick is the general area around Gruppo di Sella (a mountain cluster east of Bolzano). This area is known to skiers, hikers, and cyclists as the home of Sella Ronda because the bounding 4 mountain pass area is all interconnected by ski lifts and runs that also serve the hikers in the summer. Cyclists now can enjoy 2 summer days of Sella Ronda Bike Day when the roads connecting these passes are closed to autos. 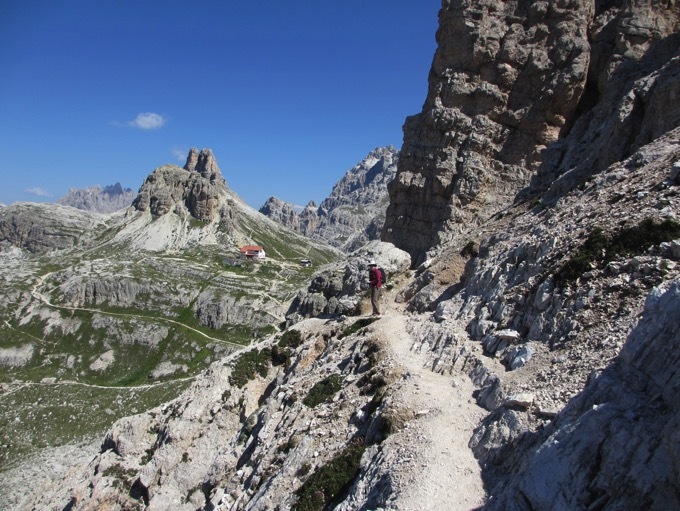 Our favorite place to stay to access hiking in the Gruppo di Sella area is in Val di Gardena. We spend 2 weeks in Selva di Gardena (Wolkenstein) during the middle season in late June and 1 week again at the end of August when middle season rates again apply. We move onto other, less expensive areas during high season. If you are visiting in the off season, I recommend staying at Ortisei (St Ulrich) instead of Selva because more services are open. We think Selva is tops for access to varied hiking trails. Corvara in Badia in the next valley, Alta Badia, is our second favorite place to stay in the Gruppo di Sella sphere. It's a shorter list of hiking options from Corvara than from Selva, but going to the top of the series of lifts from the center of Corvara gives one access to some stunning hikes. In addition, taking the 'passagiata' riverside walk towards Passo Gardena gets you to the trail head for the hike up Val di Mezdi, which is a memorable hike. We easily fill a week with hiking from Corvara year after year. Favorite passes to bike over, linger on, and hike from are Passo Pordoi, Passo Gardena, Passo Sella, and on the way to Cortina, Passo Falzarego. Tre Cime di Lavaredo (Drei Zinnen in German) northeast of Cortina d'Ampezzo is another favorite. We usually approach the area from Cortina and then base in Misurina for several days or a week of hiking. Misurina is as close as one can stay (indoors or camping) on a through road and also walk to a food market. We rely on buses traveling from Misurina to the hut at the base of the peaks for launching our day hikes. Staying at the hut at the end of the road to Tre Cime and buying meals at that hut and other huts on the trails is also an option. If you are blasting through the Dolomites in a car and only have one day for a hike, I'd recommend walking around the base of Tre Cime. It takes no planning, could be done without much in the way of maps on a clear day, and you'd be guaranteed to be kicking yourself for not budgeting more time in the mountains after you did it. In 2013, Bill, our trip planner extraordinaire, set-out to take us on a tour of the Dolomites that we'd missed in the past. Some of the areas were too distant or always seemed to hard to get to by bike, but 2013 would be the year to make it happen. The good and bad news was that we didn't find any area that we thought was as stunning for hiking and for panoramas as our above-mentioned favorites. We spent 5-7 days at each of the following venues specifically to explore the hiking options and none warranted the time we'd given them in our minds. Canazei: the Via Ferrata Finanzieri was terrific and we'll do it again when in the area; a shorter, easier hike on the knife-edge ridge from the top lift was fun; both from the lift at adjacent Alba/Penia. A lift from the center of the village will get you within striking distance of Passo Pordoi. Cavalese: pleasant but we won't bother to stop for hiking again. San Martino di Castrozza: lingering snow limited our exploring but it's a stunning view from the top of the lift and an interesting hike down to the middle lift station. It's my top pick outside of our greater Sella Ronda/Cortina area. Once we were in striking range of the Brentas at Molveno the shortcomings of the region by my standards became clear: my lovely peaks were always "over there" not "right here." What I treasure about our favorite pocket of more eastern Dolomites is the immediacy of them: you are standing on them, you can reach out and touch them, and you can see them all around you. If you've ever been to Bryce Canyon and the Grand Canyon, the experience is analogous: at Bryce you walk among the hoodoos, at the Grand Canyon you stand on the rim (or the lower trail) and look 'way over there' to the geology on the other side. Looking across the narrow valley at the Brenta Dolomites above Madonna. I also love hiking above tree line and looking out at crumbling knife-edge ridges, massive tilted plateaus, towering monoliths, and spires, which we get a hefty dose of in the vicinity of Gruppo di Sella and at Tre Cime. At Molveno and Pinzolo the experience included time in the trees and looking over at a towering cluster of peaks. Nice mountains, but they didn't dazzle me though Bill was satisfied with the experience of them at Molveno. At Pinzolo however, he was quite disappointed to discover that hiking in the mountains required an hour of walking "down and over" after exiting the lift before the experience that he was anticipating began. 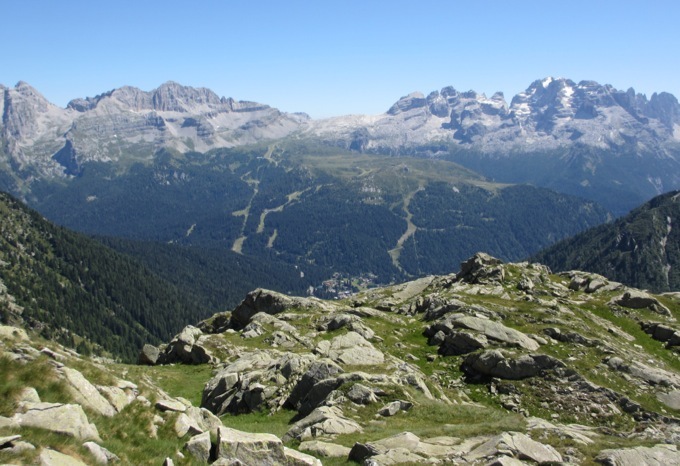 Madonna di Campiglio is THE much lauded destination in the Brentas and all of our other stops along the way were to give us time to catch our breathe as cyclists and see what there was to see where we were. Madonna definitely had more lifts and more hiking, but the panoramas still didn't come close to dazzling us like the eastern Dolomites. Multi-day hikes are necessary to actually gain entrance into the mountain clusters, unlike farther east where they are "right there" and readily accessible to day hikers. Madonna's real strong point is the numerous trails accessible from 3 of the 4 lifts, and there are a lot of them. We will stop to hike if in the area but Madonna won't be a hiking destination for us. Far less important but still a contributor to our pleasure in the Dolomites is the ambiance of our host villages. We love the buzz in Val di Gardena in the summer and each of its 3 villages is a little different. The larger, lower village Ortisei was the hub of our early experiences. It is favored by Italian families on holiday in the mountains. For many, their holiday seems to revolve around coming to the mountains to buy full mountain costumes for the entire family, including boots, and then promenading around town in their new duds. No doubt they take the lift up and have lunch at the top, but as near as we could ever determine, actually hiking wasn't really a part of the program. We used to snicker but now we share in the delight that they are having because they clearly are having a grand holiday. The middle village, St Christina, doesn't have a center to speak of and doesn't seem to have much distinctive culture. Selva, the farthest uphill of the trio, tends to pulse with hikers, roadies, and mountain bikers in a hurry to get going. People are getting high on getting higher up in the peaks. Corvara also has the charm and distinctly mountain holiday look that is carefully cultivated in Val di Gardena and that we enjoy. Cortina's pedestrian core is the most upscale in the region with more fur and gold jewelry than you'll see elsewhere. Madonna was reminiscent of Cortina with the smell of money in the air, though more intense. It's easy to be in places like Canazei, Cavalese, Molveno, and Pinzolo and not feel the crowd pressure to get out there and do something. Some have huge grassy areas that attract sunbathers and others have big sports areas for soccer and children's games. And places like Canazei have big parks that favor sitting on the benches. People come to the mountains for different reasons and we've learned that we benefit the most from being around the mountain athletes. We like being passed on the trails because it reminds us to pick up our tempo; we like studying the form of people who descend rocky slopes with greater ease than we do so we can learn from them; and we are inspired by the old codgers that are still out on the trails instead of warming a bench in town, so we prefer the high valley culture over the middle valleys. We happened upon and then rode the bike route from Tione di Trento to Pinzolo, which was quite athletic. Grades were posted as 8% at 2 places, which seemed accurate but the 10%, 15%, and over 20% short bits of up weren't signed at all. And some of the last miles of the route included over a dozen 10%+ pitches, which was very wearing at the end of a long, hot day. The Pinzolo to Sant' Antonio Mavignola stretch of bike route on the way to Madonna di Campiglio was a good workout, with the median grade probably being about 10%. It was however all paved and nicely shaded in a forest. We were told that the Sant' Antonio to Madonna segment of path was about 70% gravel, which is too hard for us on steep grades with loaded bikes so we took the main road to Madonna. The traffic was of course hectic but the grades were more moderate, frequently hanging in the 7-8% range. As is often the case in Italy, the traffic was significantly lower during the lunch/siesta period. We were told that the last couple of km to the pass from Madonna were single track and ill-advised for travelers, so we again took the main road. A website we consulted indicated it averaged 11%. All of these grades can be viewed from inside the Bicibus that runs in the region during the summer months. A short line runs from Andalo to Molveno and onto Ponte Arche, which intersects with a different line running from Trento to Tione de Trento. The Tione di Trento to Dimaro line is the longest, going through Pinzolo, Madonna, over the Pass and ending at Dimaro. This main line is served daily; some side branches are only served 1 day a week; and others are 3 days per week. Most lines make 3-5 runs in both directions on the days they operate.There is a 2E charge for your bike, plus your regular fare, paid to the driver. The 2 bicibuses we saw on the roads had a trailer designed for the bikes to hang from their front wheel. Click here for the bicibus schedule (formatted in PDF). If that doesn't work, do a google search for bicibus carisolo, Select "Bicibus - Val di Sole Bikeland", then select "Bicibus" and then "orari".